Sharp Middle East has officially launched its latest small-size touch screen LCD in the Middle East, bringing businesses an expanded range of versatility through smart design and intelligent integrated features. The region had a first look at the device on Sharp’s stand during Infocomm 2012, held during Gitex Technology Week last year, but the small size screen packed with technology is now officially available across the Middle East, a statement from the company said. The full HD unit is primarily a PC monitor, however the in-built features give it flexibility beyond the notion of a traditional PC screen, making it truly multi-use for businesses. It is right up-to-date with the latest features, with full Microsoft Windows 8 touch function compatibility, and the zero bezel flat screen enables smooth Windows 8 touch operations, the statement said. “The feedback we received during Infocomm about the model was hugely positive, especially with the unit running on Microsoft Windows 8, with visitors intrigued at the numerous applications the display can be used for, so we’re very excited that we can now offer this to our customers across the Middle East,” he said. One key feature of the display is its use of the world’s thinnest pen point stylus. The pen, at 2mm, makes detailed notes, precise pointing and neat digital handwriting smooth and natural. This, combined with the innovative palm cancellation feature, which prioritises pen recognition so users can write with the touch pen even if their palm is resting on the screen, opens up a range of uses for the unit including electronic signature boards and education or business note taking directly on a presentation, the statement said. One of the most attractive features to business looking to supplement an existing professional display installation is the full compatibility with many of Sharp’s other professional LED displays. The 20-inch is ideal as a digital lectern or teaching aid linked to a large size professional displays such as Sharp’s 90-inch, or a Sharp video wall, enabling audiences such as students to see exactly what the teacher is doing through real time mirroring, all in high-definition. Depending on the application desired, the monitor can be inclined at 10 degrees – perfectly angled for handwriting with the stylus – as well as being used flat on a table top or mounted in standard ‘standing’ style at 75 degrees for easy viewing in a group situation. 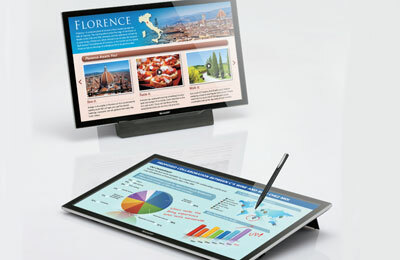 Sharp is targeting a variety of applications and vertical industries with the 20-inch. In addition to using it to control larger LCD signage and video walls, there are uses as diverse as interactive touch signage at airports, shopping malls, and travel agencies, along with hospitality and banking uses and medical uses in hospitals and dental surgeries for going through digitised doctor’s notes, scans and diagnoses. The model slots into the Sharp professional LCD line-up at the smaller end of the scale, giving businesses the opportunity to select models from 20-inch all the way up to 108-inch.